Have you seen the gorgeous furniture we have at Châteaux de Restorsea? 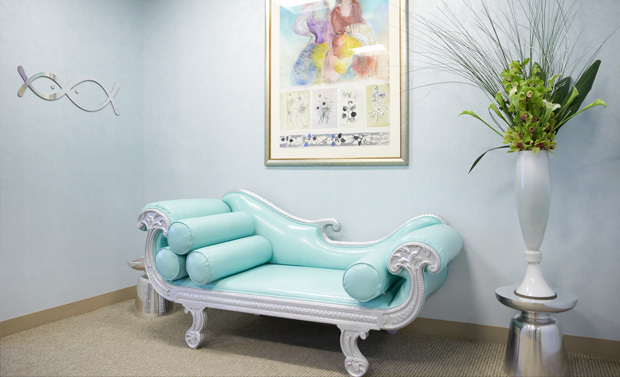 Did you know about the set of original Versace pieces that we reupholstered in our own Restorsea colors? Acquired through Patti’s equally fabulous mother, Joanne, the furniture set comes straight out of the late Gianni Versace’s Fifth Avenue Townhouse, and is now divided between Restorsea’s home base, Patti’s UES apartment, and Joanne’s home in Houston, Texas. In our offices we hold four Italian Neoclassical arm chairs (two in our conference room and two in Patti’s office) and an Italian Baroque settee in our entryway; all of which originally came with the house of Versace fabric, but couldn’t be salvaged due to old age and wear and tear. Instead, we decided to marry these pieces with the Restorsea brand, and refurbished each with a bold green and blue vinyl - the yin and the yang of Restorsea, if you will. See the before and after photos below!